D.A. Pennebaker makes films about rock stars. Sometimes, they are literal rock stars—as in his famous debut, 1967’s “Don’t Look Back,” or subsequent docs about Jimi Hendrix, Jerry Lee Lewis, and Depeche Mode. But even when he strays from the musical arena, he gravitates towards those who are subverting the status quo or pushing the boundaries of a pre-determined system. “The War Room,” his 1993 political documentary about the Clinton campaign, showcased the star qualities of James Carville and George Stephanopoulos, who changed the fundamentals of political campaigning and have since become outsized media personalities. Their latest subject, Steven Wise, is a rock star in his own way. Wise is an animal rights lawyer and founder of the non-profit Nonhuman Rights Project who has spent the last decade building and arguing a case for chimpanzees to achieve legal personhood. To make “Unlocking the Cage,” Pennebaker and his partner/wife Chris Hegedus followed Wise and his team for three years through the ups and down of their court case. The film is a thoughtful work of advocacy and an insightful profile of Wise, yet another subject of Pennebaker’s who is changing the system from the inside out. RogerEbert.com spoke with Pennebaker and Hegedus about their film, how a dog changed their lives, whether animals should be used in films and more. I’ve already heard the film draw comparisons to “Blackfish,” but you’ve been working on “Unlocking the Cage” since before it came out, right? CH: I met Gabriela there, and she was still shooting “Blackfish” at the time. She was terrific, and I was so happy to see the response her film got. It definitely expanded our consciousness a little. I wonder if it created even more of an audience for your film. DP: Well, our thinking on this issue is changing worldwide. It’s interesting to see it happen because it’s like the introduction of the phonograph record or the automobile. You know, it changed everything but nobody noticed right away. And it has been a change for you, right? You weren’t animal activists when you began this project. DP: No, no. Our daughter made us bring back a dog from California. We had no idea why anyone would have a dog in New York. Who wants to walk it on a rainy winter day? But we brought it back because she told us to, and I subsequently realized how much wiser she was than we were. It changed our lives. CH: On a lot of our films, we don’t really know what the subject is, and we get to learn it along the way, which is one of the privileges of making documentaries. You get dropped into worlds that you want to know more about. Because of our dogs, we started to understand animals more, and we began to feel a change. When Steve Wise came to see us about following him on his journey—his life’s pursuit—we were very interested, although we had no idea what it meant to go into a court and argue that a chimpanzee could be a legal person. It seemed like there was some guerilla work (pardon the pun) involved in the film, particularly when you were filming the conditions of the apes in captivity. Was there any actual danger? CH: Well, it was just me. We didn’t have much funding for the film, so most of the time I went out alone with the camera and Steve, as he tried to find his chimpanzee plaintiffs. You know, you don’t want to advertise that you are out there to eventually take the animal away from their owners. But a lot of times, it seemed like the owners were just stuck in a different ideology—as we used to be—of where animals stood in the hierarchy. I think many of them took the animals initially to protect them from even worse care, even though they weren’t ready to give them up. Was there a moment in making the film when you realized you had become advocates for this issue as much as documentarians? 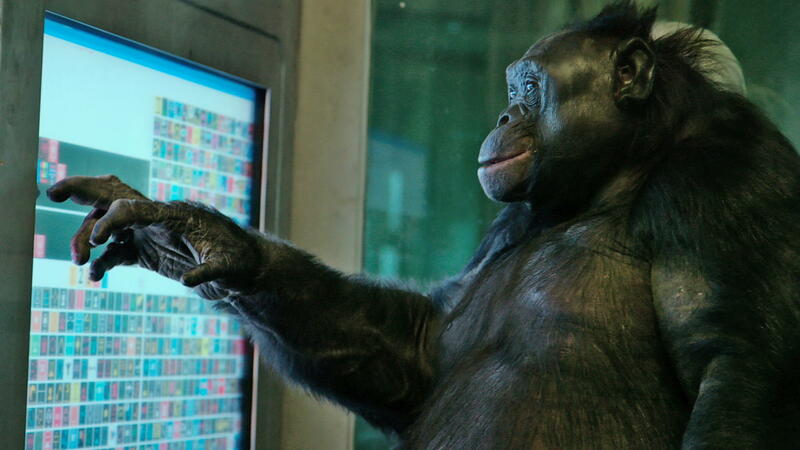 CH: I think I became an advocate pretty early on when I went to see Kanzi, the bonobo who uses the computer board to speak. It was a real eye-opener for me because I could see that he understood English very well, and that was almost scary. It was way beyond the way I communicate with my dog. 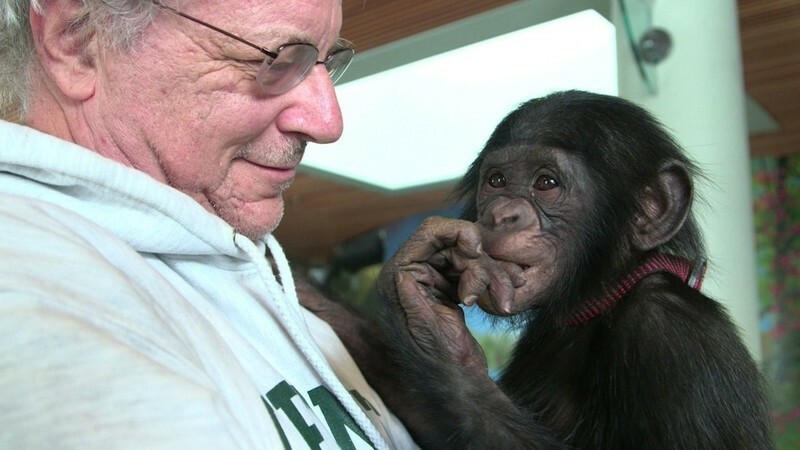 In the film, Kanzi’s caretaker asks Steve if he is planning on making the argument that chimpanzees, because of their cognitive abilities, deserve more protection than other animals. I think there is a lingering question in the film of whether all animals deserve personhood, or just chimpanzees. What is your take on that? CH: That’s a criticism of Steve from different people in the animal rights world, but this is how he thought he could form his case. Legal cases are built on precedent, and he felt that arguing for autonomy—equality—would make the most sense, as well as using the animals that are the most scientifically-studied. DP: Also, it turns out it’s a little difficult to determine exactly what the intelligence of an animal is. Ants are very intelligent. Are they animals worth saving? This gets very complicated, but as time goes by our curiosity is going to lead us to find out more. I suspect we’re going to find out that all animals can speak to each other, and that’s going to change the way we see all of them. You guys seemed to have changed so much in a short period of time. It’s amazing that all this started with you getting a dog. DP: I know! I have a picture of that dog that I’m looking at right now. That dog was my mentor. He taught me something I didn’t think I needed to know. Some of the most dramatic scenes in the film take place in the courtroom. Was it difficult to get permission to film in the courts? CH: Yeah, it was very hard. Sadly, we were unable to film the very first filing, but we’re very lucky to have been able to film in the other courtrooms. It’s really at the whim of the judge, and we were grateful to have gotten their permission. The filming itself was still pretty restricted in terms of where you can put the camera. You have to kind of move stuff around at the last minute and hope for the best. One of the problems we ran into in Albany—the appeals court with the five judges that closes the film—is that they have never had anyone ask to plug into their audio sound system, which was necessary. A lot of cases are big news there, but the TV and radio news just use the actual dialogue in the court as wallpaper, and they talk over it. They don’t care so much about the sound in the same way we did, where we wanted the arguments to be part of the story. There has been a debate over the use of exotic animals in entertainment over the last few years. As CGI and motion-capture technology have advanced, some advocates are arguing that it’s no longer necessary to use animals in film at all. What do you think? CH: I definitely think it should not be done anymore. There was a time when we didn’t understand what it entailed. A lot of the animals I met on this journey—at sanctuaries—had once been used in entertainment, mostly commercials. Many of them are very damaged from the abuse and captivity they suffered. DP: It’s not what actually happens on set that is the trouble. It’s the years they are kept in a cage or trained to obey orders that are very damaging. It’s enslavement, and that’s Steve’s whole point. He wants to stop that enslavement. So now that you’ve had this transformation, do you see yourself making more films about animals? DP: You never know. All these films come to us through the front door. Someone knocks on the door and says, “I have an idea for you.” If we can raise the money and figure out how to do it, that’s how the film gets done. I’m sure, as a result of this film, animal lovers or maybe even animals themselves will come to the door. We’ll respond. And why not? We’re filmmakers, that’s what we do. We respond.